Home > Blog > What Should I Ask My Surgeon Before Rhinoplasty? Here are various questions you may want to ask your Rhinoplasty surgeon before your procedure. 1: What made you decide to become a cosmetic surgeon? How long have you been practicing as a cosmetic surgeon? 2: Are you board certified? If so, by what board and for how long? 3: Have you ever been disciplined by the board or by the state? 4: How many rhinoplasties have you performed? 5: How many revisions of your own work, on average, do you have to perform? 6: How many rhinoplasties do you perform on average, annually? 7: Have you or would you be willing to perform this procedure on a loved one or family member? 8: Would there be any reason that I would not be a good candidate for a rhinoplasty? 9: What are the complications for rhinoplasty? 10: Do you prefer to perform your procedures open or closed? Why? 11: Are there other techniques, newer ones perhaps, that I am not aware of? 12: Do you have a video of a rhinoplasty being performed that I can watch? 13: How long do you recommend I take off from work, school, etc. to heal properly? 14: What types of medications will I be given and which pain medications do you normally prescribe? 15: What kind of anesthesia do you use for rhinoplasty? Why? 16: Can I look at a portfolio of before-and-after photos, and not just your perfect ones? 17: Where will the surgery be performed? If the surgery will not be done in a hospital, is the surgery center or suite accredited? 18: Do you have hospital privileges and, if so, at what hospitals? If you don't have hospital privileges, why not? 19: Who will administer anesthesia and what are that person's credentials? 20: What tips do you have for me to ease some discomfort and pain? 21: I wear eyeglasses. Will I be able to wear them the day after surgery on top of the cast? When can I wear my glasses normally? 22: I take (birth control, diet pills, antidepressants, etc.). Will I have any adverse reactions from the prescribed medications or anesthesia? 23: If my results are not what I wanted, what is your policy on a revision? 24: Do you believe my expectations can be met? 25: What if I change my mind and back out, will my money be refunded? 26: If I have an emergency the night after surgery, what should I do? 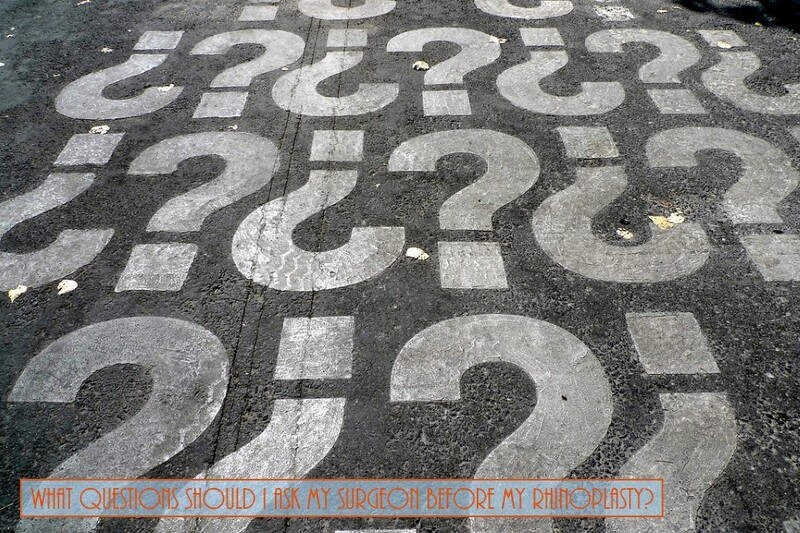 27: If I will need sutures, when will they be taken out? 28: Are there any hidden costs that I should know about, such as for lab work, postoperative check-ups, or additional medications? 29: If I need anything after-hours after the surgery, how can I get in touch with you or your staff? 30: What are your policies on postoperative care? 31: Do you offer financing? Do you expect full payment up front? Can I pay in increments? 32: Will I need a graft? If so, what kind? 33: After surgery, will my nose be packed? With what type of packing? For how long? 34: Who will be present in the recovery room with me, and what are their qualifications? 35: How far in advance is it necessary to schedule a surgery date?